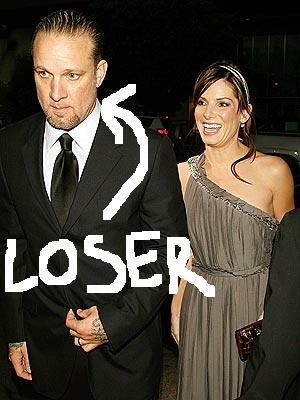 Jesse James cheated on Sadra Bullock -Loser! Jesse James "Blindsides" his Wife -Did Jesse James cheat on Sandra Bullock? It sure seems so! Life is full of surprises. Sandra Bullock is on top of the world professionally, but in a whirlwind personally. Recent claims and allegations came out that her husband Jesse James cheated on here with a woman named Michelle "Bombshell" McGee. On Wednesday InTouch magazine featured a story based on an interview with Michelle Mcgee. "It's because of my poor judgment that I deserve everything bad that is coming my way," his said in the statement. "This has caused my wife and kids pain and embarrassment beyond comprehension and I am extremely saddened to have brought this on them. I am truly very sorry for the grief I have caused them. I hope one day they can find it in their hearts to forgive me." That apology sure seems to indicate that Jesse James cheated on Sandra Bullock. As the cover story allegations were emerging, Warner Bros., the film behind "The Blind Side," issued a statement on behalf of the film's star, Bullock, who said she would not be attending the British premiere of the film she won the Best Actress Oscar for. "Due to unforeseen personal reasons a trip abroad to support 'The Blind Side' has been deemed impossible at this time," the studio's statement from Sandra read. "I apologize for any inconvenience this may have caused and thank you for your continued support of the film." I really with for Sandra personally. She seems like a very nice woman.